How do you build a Guggenheim museum? 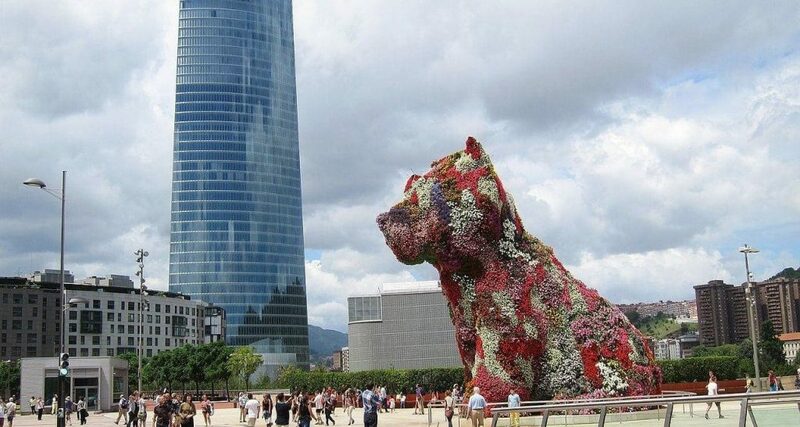 Since it opened in 1997, a guard dog known as Puppy has guarded the doors of the Guggenheim Museum in Bilbao with a changing mantle of tens of thousands of flowers. Always on guard, this West Highland white terrier, a “small” 12.4-meter-tall Scottish white furred dog about 16 tonnes in weight (yes that’s correct! ), has been welcoming visitors for nearly two decades. It doesn’t matter whether it’s rainy or sunny or if winter pansies blossom in his coat; or even if nobody shows up to take his picture early in the morning. He waits patiently at the cultural gates for someone to come and take a picture by his side. The city and museum’s tourists don’t hold back…they run towards the statue to get a chance at a selfie… and to think that Puppy was originally confused for a cat! This sort of photography is easier than trying to capture Puppy’s full scale, although you can often see how tourists back up several steps to search for the perfect frame. Others get close to his base and touch his flower-covered fur since Puppy has no fence to protect him from visitors’ great affection. 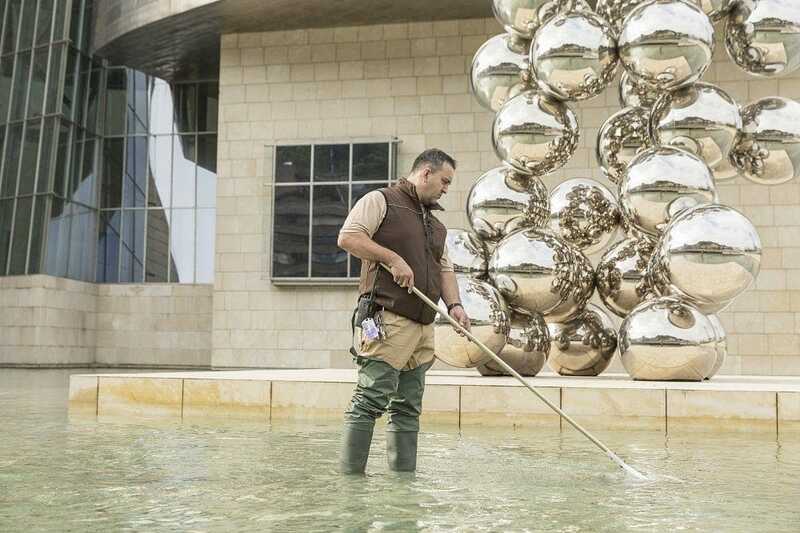 We will tell you all about Puppy, the statue by Jeff Koons, and his maintenance. But since the time Puppy was planted (literally!) in the space that today is home to the Txema Aguirre Square, he has not moved. Always attentive to how Basque society made the leap from a Bilbao dependent on the steel industry to a service-based industry. Puppy was not born in this square, which took a while (and a tragic event) to come to be affectionately referred to as “Txema,” but rather a few years beforehand in the courtyard of the Baroque castle of the small German village of Waldeck, near the town of Bad Arolsen, and on the slope of the lake that forms the Eder river as it passes through the region. At that time in 1992, Documenta IX was taking place and 195 artists were congregating in the area. Jeff Koons, at that time an artist somewhat in conflict with his ideas, could not miss anything in the picture. He carved a first version of Puppy in “only” 11 meters of wood, but this temporary work of art was destroyed on-site after the completion of the project. It is said that this version had flowers that were larger than the current Puppy, which were built from steel. People tend to associate the steel with which Puppy is made with the Bilbao shipyards that ended up dislodging the terrier, but the truth is that Koons presented this definitive Guggenheim mascot at the Museum of Contemporary Art in Sydney, on the other side of the planet, in 1997. 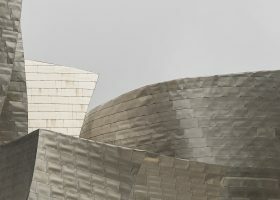 The fact that the flowers would grow “in an unequal and anarchic way” pleased both Koons and the Guggenheim Foundation, which made haste in purchasing the sculpture the same year for $1.2 million, and left him guarding over the entrance of its Bilbao museum, in the same place where he stands today. But there’s a difference: today that same flower statue is valued at 54 million dollars (4,500% increase in value in two decades). It seems like it was a good investment even if we’re only talking about the tourist smiles it has inspired! This Sidney Puppy, in addition to his disappeared German brother made of wood, has two others. One, somewhat older, is the artist’s test of the Bilbao Puppy, and after several years being exhibited at Rockefeller Center (NY) and at the Hermitage Museum in St. Petersburg, it was acquired by Peter M. Brant and finally exhibited (out of the public eye) on his Connecticut estate. This American businessperson and philanthropist has a history with the works of Koons, and that is why he also bought the Balloon Dog a few years ago. 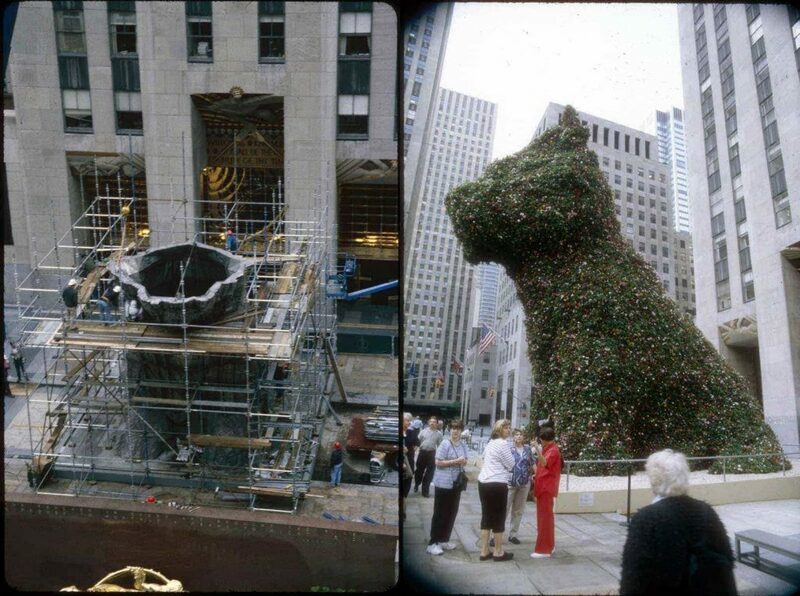 The Puppy Artist Test being mounted in 2000 at Rockefeller Plaza. Credit: Samuel Murray, Bart Barlow and Patrick McMullan . Puppy’s second brother is much smaller (and maybe that’s why it is more adorable?). It is 106.7 cm high and basically a lithograph born in 1999 that today sells for $7,500 or $10,000. 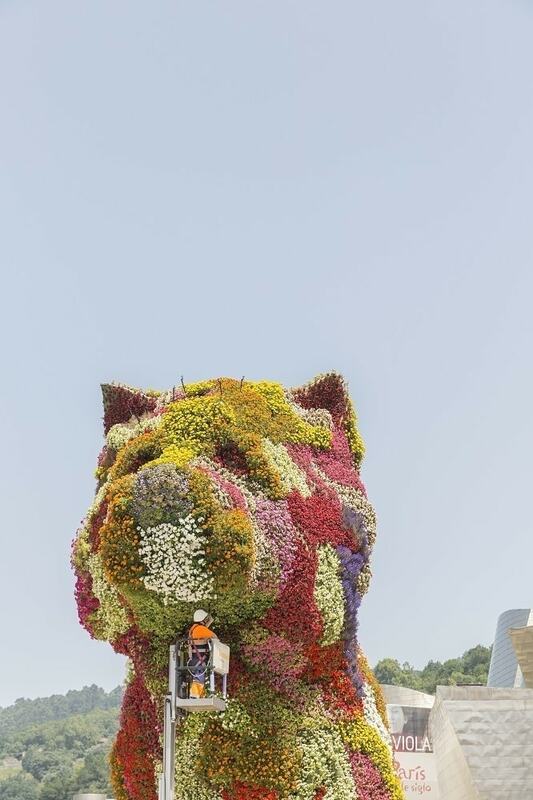 Not on the same scale, however, as the Guggenheim flower dog whose caretakers have been kind enough to answer a few questions. As occurs with the interior of the museum and with taking care of their facades’ curves, Puppy’s maintenance is handled by a specific team of professionals who go out of their way to give him the attention he deserves. He is a living dog only on the outside…but requires attention anyway. We will talk to Koldo Nieto , Infrastructure Manager of Ferrovial Services and Manager for the Guggenheim Museum, who helps us understand the reasons why a living statue stands facing other statues surrounding the museum, such as Mama, the steel spider that we find on the other side of the building, or the bubble tree. 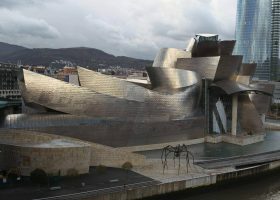 “The various exhibitions that the Guggenheim Museum has been putting on since its opening in Bilbao have sought to embrace the multiple disciplines of contemporary art and this sculpture is another example of diversity in art”. Koldo has confirmed that the Solomon R. Guggenheim Foundation acquired it in 1997 and installed it in the place it now occupies in order to welcome us, and it is Ferrovial who selects the plant varieties. The colour, however, was chosen by Koons decades ago to emulate the classic gardens of the eighteenth century. These plants have “two stages: on one hand autumn-winter and on the other spring-summer”. Depending on the time of year, we will find a different composition of plants. For example, “October to May is covered with […] winter pansies and primroses, but there is much greater variety in spring and summer: begonias, ageratums, tagetes, petunias, lobelias, balsams, iberis…combining warm colours like red, orange, white or pink. 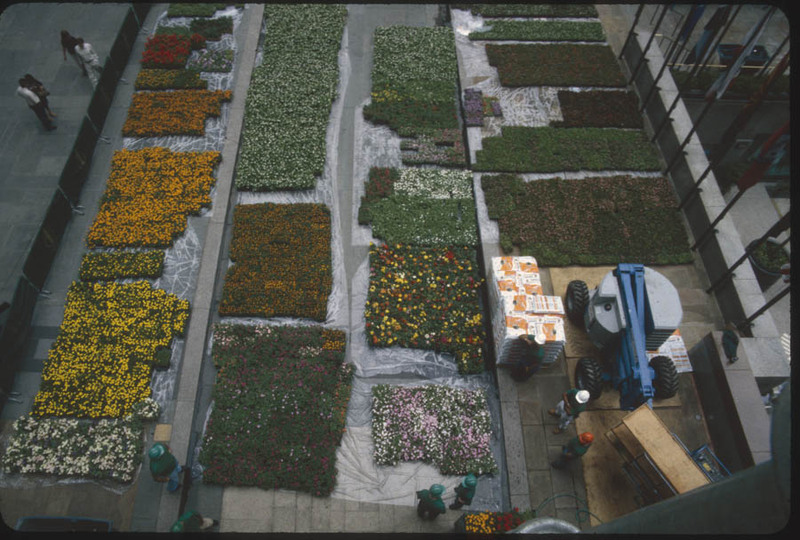 When we ask how many flowers there are, Koldo replies that “complete coverage consists of 37,000 plants that are changed twice a year.” Their replacement must work like clockwork since “these plants are prepared specifically for this location[…]. Once the new plants are put into place the nursery begins the preparation and growth of the next order for its implementation in six months”. The plants are alive and they must remain healthy and be looked after for six months. These plants are supported on peat from which they are supported by metal mesh, all covered with geotextile. His weight? 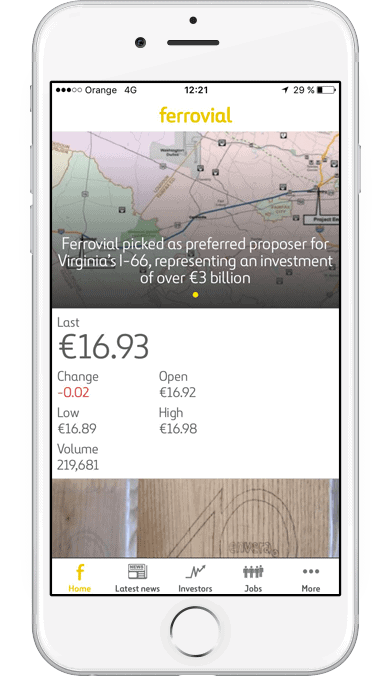 “Around 16 tonnes”, confirms Koldo. Puppy has excellent care, since “periodic weekly and analytical reviews are made of both the condition of the substrate (composition and nutrients) and the plants due to possible diseases or deficiencies.” This means that each week is “given several days” exclusively, and while changing flowers, “up to 30 gardeners work simultaneously “. This change of petals is not an easy task, since it takes a whole week, Monday to Sunday, since scaffolding is mounted until the statue is set free once more with his new suit. 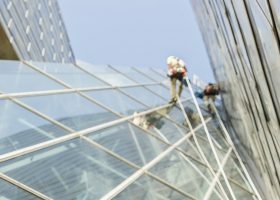 Even the change of substrate, which takes place every several years, entails two whole weeks of work. Fortunately, Puppy is a beloved pet and vandalism has been minimal. At first there were those who would steal flowers, “but lately the biggest source of problems we have been having are dogs who come up to leave their own ‘gift’“, which is really a matter of [lack of] civility of some pet owners. What does the flowered statue that protects the Guggenheim mean? Koons designed this public sculpture with the aim of attracting, arousing and infusing, in his own words, “optimism, confidence and security“. 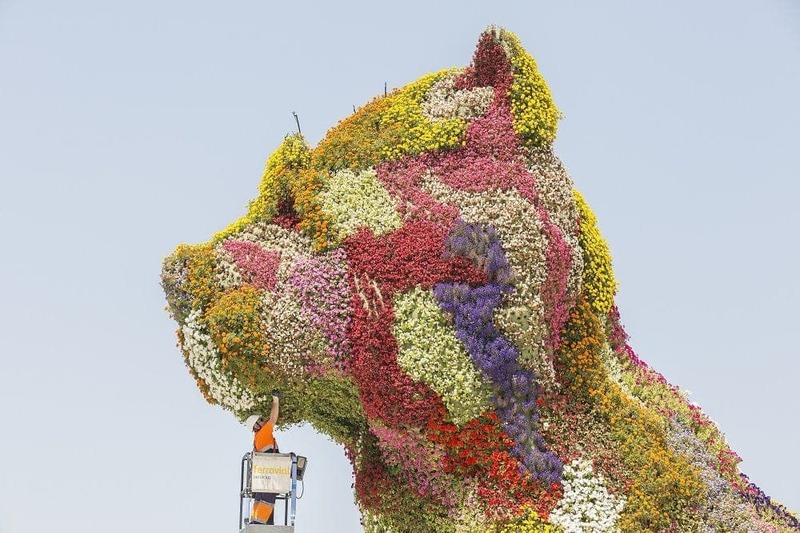 After all, we are talking about a 13-meter high dog covered with flowers. Dog and flowers are two concepts that hardly conjure up different values. Of course, for tourists the perception changes a lot, as we can see from the reviews that visitors have given it. Some stay around the flowers, others are impressed by how well Puppy is cared for (congrats go to Koldo , Kepa Sutil Llona (gardening manager) and Service Chief Arantza Gorraiz Etayo), others share “????? ?” emoticons to give importance to their visit, and of course there are those who just think “wow! beautiful! great!” and they run up and take photos. This was not the last time a Koons statue lit up the Guggenheim. Their bouquet of tulips are just around the corner from the museum and are part of the Celebration collection. This collection is associated with birthday parties, holidays and other fun events. Are you going to come visit the museum?